Florence L. Kinzer wrote a social letter to Martha Berry thanking her for the kind thoughts and cotton pods. Kinzer offers Berry best wishes for a Happy New Year. Mary (Hannah) Jennings writes to Martha Berry, thanking her for the "charming" box of cotton and the enjoyment it brought to her home. Mrs. Jennings also encloses a small donation to her "wonderful work." 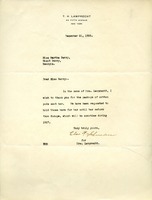 A thank you letter from Henry Hornblower to Martha Berry regarding receipt of a box of cotton pods from the Berry Schools during the holiday season. Writing on the behalf of Mrs. Lamprecht, Elsie thanks Miss Berry for the package of cotton and assures her it will be delivered to Mrs. Lamprecht when she returns from Europe in the new year.